If you want to periodically create synthetic full backups, on the Backup tab, select the Create synthetic full backups periodically check box and click Days to schedule synthetic full backups on the necessary week days. 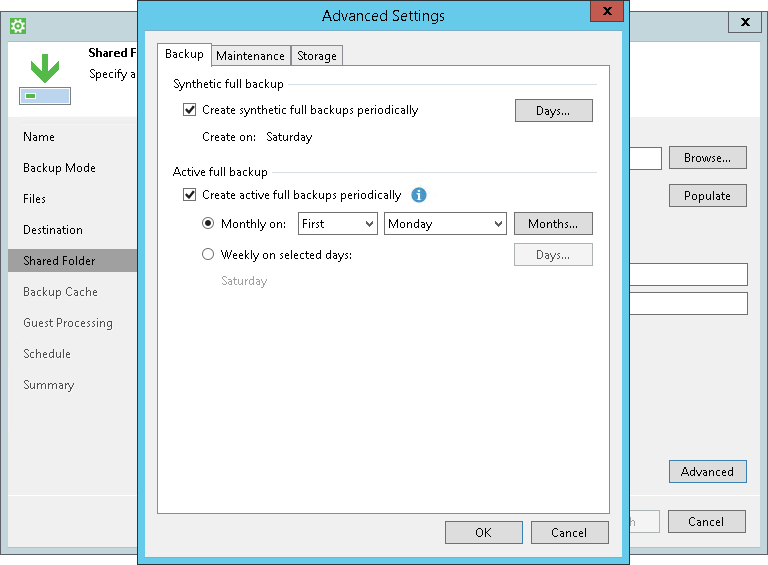 If you want to periodically create active full backups, select the Create active full backups periodically check box. Use the Monthly on or Weekly on selected days options to define scheduling settings. Before scheduling periodic full backups, you must make sure that you have enough free space on the target location. As an alternative, you can create active full backups manually when needed. For more information, see Creating Active Full Backups. If you schedule the active full backup and synthetic full backup on the same day, Veeam Agent for Microsoft Windows will perform only active full backup. Synthetic full backup will be skipped.